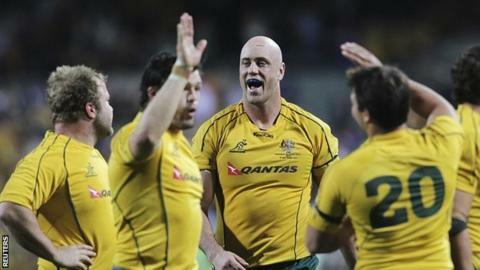 Australia beat South Africa 26-19 in Perth, their first victory in the inaugural Rugby Championship. The Wallabies trailed 13-6 at half-time but second-half tries from Scott Higginbotham and Ben Alexander made it five wins in a row over the Springboks. Two late tries from wingers Julian Savea and Cory Jane gave New Zealand a 21-5 victory over Argentina in Wellington. The All Blacks top the table after three straight wins. Back-to-back losses to the All Blacks made the South Africa game a must-win Test for the Wallabies and coach Robbie Deans. But the hosts were poor in the first half, falling behind to Springbok winger Bryan Habana's 42nd Test try. South Africa, who drew 16-16 with Argentina in their last outing, had the edge at the set-piece and put in plenty of powerful running but lacked a spark in the back-line to convert the pressure they created. And scores from forwards Higginbotham and Alexander and a perfect kicking display from Berrick Barnes, who kicked six from six, just about got the defending champions across the line. There was one major downside to Australia's day however, as Will Genia - standing in as captain with James Horwill and David Pocock already ruled out of the championship - was forced off with a knee injury 10 minutes from time. "I took a high ball and twisted and heard a few cracks," said Genia, who was on crutches with ice on the injured joint afterwards. "It's actually quite sore so I'll have some scans and see what comes of it." In driving rain and gale-force winds at Wellington Regional Stadium, Argentina were brutal in defence and controlled the tempo of the game, at least until the final quarter. The All Blacks led 6-5 at half-time, fly-half Aaron Cruden kicking two penalties and veteran prop Rodrigo Roncero scoring the Pumas' only try after centre Ma'a Nonu was turned over inside his own 22. The stadium was plunged into darkness during the break because of a power cut, which delayed the start of the second half for about 15 minutes. Cruden kicked a penalty shortly after the restart but it was not until the 66th minute that the All Blacks finally got a back-line move to work, Nonu and Conrad Smith committing players and feeding Savea for a try in the corner. Six minutes later, Jane scored in the opposite corner from a long miss-pass by Cruden to put the game out of reach. "They put us under a bit of pressure but I was very happy with the way we came out in the second half," said All Blacks captain Richie McCaw. "We played at the right end of the field and that pressure told in the end." Next Saturday, New Zealand host the Springboks in Dunedin while Argentina travel to the Gold Coast to play the Wallabies. New Zealand: Israel Dagg, Cory Jane, Conrad Smith, Ma'a Nonu, Julian Savea, Aaron Cruden, Aaron Smith; Tony Woodcock, Keven Mealamu, Owen Franks, Luke Romano, Brodie Retallick, Victor Vito, Richie McCaw (captain), Kieran Read. Argentina: Martin Rodriguez, Gonzalo Camacho, Marcelo Bosch, Santiago Fernandez, Horacio Agulla, Juan Martin Hernandez, Nicolas Vergallo; Rodrigo Roncero, Eusebio Guinazu, Juan Figallo, Manuel Carizza, Patricio Albacete, Julio Farias Cabello, Juan Manuel Leguizamon, Juan Martin Fernandez Lobbe (captain). Australia: Kurtley Beale, Dom Shipperley, Adam Ashley-Cooper, Berrick Barnes, Digby Ioane; Quade Cooper, Will Genia (capt); Benn Robinson, Tatafu Polota Nau, Ben Alexander, Sitaleki Timani, Nathan Sharpe, Dave Dennis, Michael Hooper, Radike Samo. South Africa: Zane Kirchner, Bryan Habana, Jean de Villiers, Francois Steyn, Francois Hougaard, Morne Steyn, Ruan Pienaar; Tendai Mtawarira, Adriaan Strauss, Jannie du Plessis, Eben Etzebeth, Juandre Kruger, Marcell Coetzee, Willem Alberts, Duane Vermeulen.